Wilson was placed on injured reserve Tuesday with a shoulder injury, Rick Stroud of the Tampa Bay Times reports. Analysis: Per the report, Wilson suffered a shoulder injury during Sunday's loss to the Redskins. He rushed two times for seven yards in the contest but will now likely be sidelined for the remainder of the season. On the season, the undrafted rookie out of Duke recorded six rushing attempts for 29 yards and caught three of five targets for five yards. Wilson rushed twice for seven yards and brought in one of three targets for minus-4 yards in the Buccaneers' 16-3 loss to the Redskins on Sunday. Analysis: Wilson saw his offense role increase slightly, as he logged 10 snaps from scrimmage. However, the speedy rookie still remains firmly behind Jacquizz Rodgers as the backup to Peyton Barber, and he could well revert back to inactive status on most weeks once Ronald Jones II (hamstring) is healthy enough to return to action. Wilson rushed twice for seven yards and returned one kickoff for 25 yards in the Buccaneers' 42-28 loss to the Panthers on Sunday. Analysis: Wilson only played on four snaps from scrimmage, but he logged touches on half of them while also serving in the primary kickoff return role as expected. Wilson's active status was the byproduct of Ronald Jones II's hamstring issue, and with the unpredictable nature of soft-tissue injuries, it's certainly conceivable the former gets another opportunity to suit up in Week 10 against the Redskins. Wilson is a candidate to see action on kickoff returns against the Panthers in Week 9, Scott Smith of the Buccaneers' official site reports. Analysis: Wilson is active for the first time since Week 3. The speedy rookie logged only eight snaps total on offense over the first three games of the campaign, but he contributed 97 return yards through his work on kickoffs. Despite his active status and Ronald Jones' (hamstring) absence, Wilson is unlikely to see more than a scant number of carries behind Peyton Barber and Jacquizz Rodgers. Wilson will be active for Sunday's game against the Panthers, Scott Smith of the Buccaneers' official site reports. Analysis: Wilson has been a healthy scratch for the last four games, but he'll dress in Week 9 with Ronald Jones (hamstring) sidelined. The undrafted rookie out of Duke is unlikely to see a significant offensive role behind healthy backs Peyton Barber and Jacquizz Rodgers but could see involvement on special teams. Wilson (coach's decision) is inactive for Sunday's Week 4 tilt against the Bears, Scott Smith of the team's official site reports. Analysis: The reserve running back is the odd man out with 2018 second-round pick Ronald Jones II enjoying active status for the first time Sunday. Wilson's absence doesn't have an appreciable impact on the team's base offense, but Jacquizz Rodgers will presumably take over Wilson's kick-return duties. 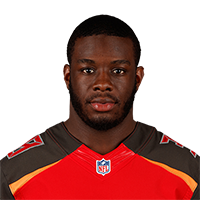 Wilson brought in both of his targets for nine yards and returned five kickoffs for 68 yards in the Buccaneers' 30-27 loss to the Steelers on Monday night. Analysis: Wilson logged both of his touches from scrimmage over just three snaps, but as usual, his biggest contribution came as a returner. The speedy rookie's gameday spot seems to be secure for the time being due to his work on special teams, although matters could change whenever the team decides to begin activating 2018 second-round pick Ronald Jones II, a healthy scratch for all three of Tampa's contests thus far. Wilson rushed once for six yards and returned one kickoff for 29 yards in the Buccaneers' 48-40 win over the Saints on Sunday. Analysis: The speedy rookie logged two snaps from scrimmage, and even those were likely only made possible by Ronald Jones II's inactive status. Wilson is still expected to see the overwhelming amount of his touches on special teams, but as was the case Sunday, he's likely due for an occasional carry in any contest that Jones is inactive and Wilson thus serves as the No. 3 back behind Peyton Barber and Jacquizz Rodgers. Wilson made the Buccaneers' 53-man roster and is expected to serve as both the No. 4 running back and primary kickoff returner to open the regular season, Scott Smith of the team's official site reports. Wilson rushed three times for 10 yards, secured his only target for 11 yards and returned five kickoffs for 133 yards in the Buccaneers' 33-30 preseason loss to the Lions on Friday. Wilson did not participate in Saturday's practice due to an undisclosed injury, Brooke Pryor of The Kansas City Star reports. Analysis: The details surrounding Wilson's health are still unknown, so the tailback should be considered day-to-day until an update is provided. Wilson's best chance of making Tampa Bay's final roster this season is likely as a return man on special teams. 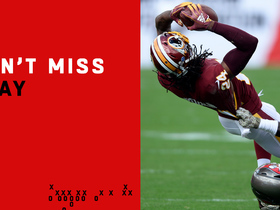 Washington Redskins cornerback Josh Norman intercepts Tampa Bay Buccaneers quarterback Ryan Fitzpatrick in the end zone for a 32-yard interception return. 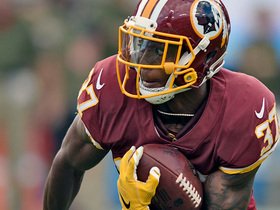 Washington Redskins cornerback Greg Stroman intercepts Tampa Bay Buccaneers quarterback Ryan Fitzpatrick and returns the interception 24 yards.